While other Match-3 games support only one gameplay mode (Swap or Chain), Lost in Reefs 2 goes a step further by now including Group, a third, new gameplay mode. Swap pieces between spots, trace a “chain” between identical pieces, or – now – explode groups of similar colors. And to complete a level, destroy the marble plaques. It’s harder than it sounds! 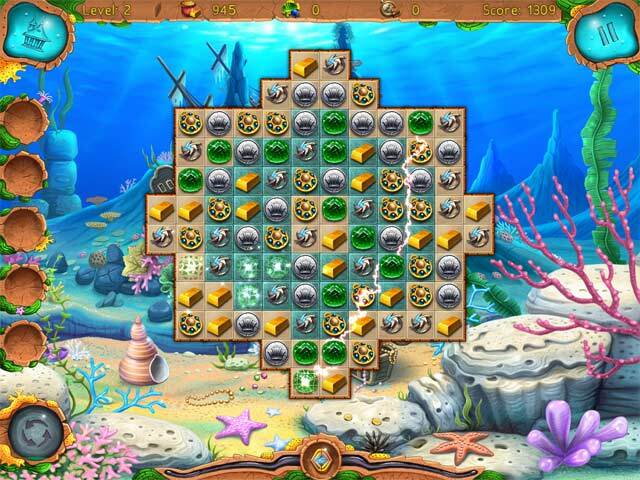 Another game exclusive is the shape of the playing field: Lost in Reefs 2 offers a traditional rectangular field as well as an innovative six-sided one for a greater challenge. 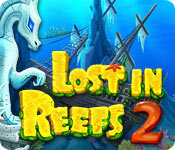 Lost in Reefs 2 is rated 4.2 out of 5 by 29. Rated 5 out of 5 by tutortime from Loved it! I wish they would make a #3. These games are so much fun to play and build the cities. Rated 5 out of 5 by RevKellie from L-O-N-G Game, but relaxing This is a great game for people who play Match 3 games to relax or meditate. Soothing Music and smooth play guides you game by game through this long adventure. Pros: Beautiful graphics, predictable consistent bonus objects, easy to understand, use. Nice additions as you build along, and the game lasts for months as you try to fill all the slots. Cons: They make you play all three types of Match. The group and slide ones are fine - but I hate connecting match games but it forced me to play a number of those before it opened up to other modes. All in all - enjoyable, relaxing and smooth. 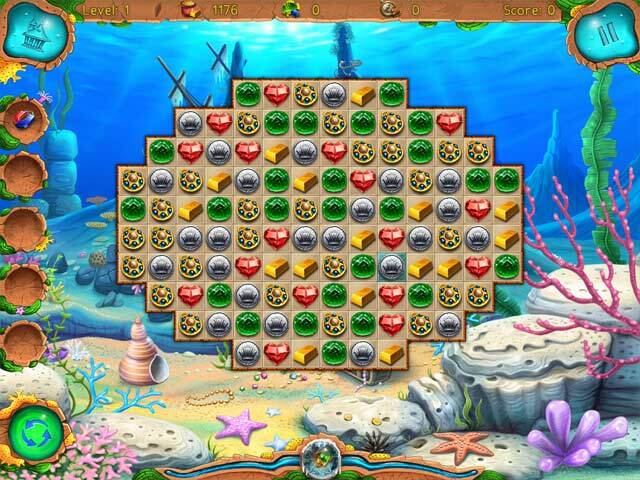 Rated 5 out of 5 by BlackWaterRules from Fun, Fun, Fun This Match 3 has 3 different ways to play, 3 groups of items to match : tools, sea creatures, and treasures. It is a lot of fun, the music is great, the scenes are colorful. It is a lot of game for the money. Rated 5 out of 5 by csivell from Great value game!! I thought that this game was great value and taught me moves that I didn't previously know!! Great one for us,that are,a little more mature in years! Try the one hour free... I'm sure you will want to continue! Rated 5 out of 5 by mysticunicorn22 from Don't let everyone talk you away from this game I'm only a half hour into my demo and I've gotten everything unlocked as far as the modes go and it wasn't that hard. If you liked the first one you will like this one. Someone else said they couldn't find the relaxed mode....that's the first thing that pops up...how can you miss it? I love games like this one so please try it and don't let others try to tell you not too. Rated 5 out of 5 by pennmom36 from Match 3 Honeycomb Style! What a beautiful Match 3 game, the Lost reefs of dragon city where long ago man lived side by side with beautiful dragons! Now you can rebuild this mesmerizing reef city with the money you earn by purchasing various items like corals and statues, then upgrade them as you conquer new levels. At first you only get the option of match 3 and after a few levels they introduce I new concept I haven't seen before, the game board becomes a honeycomb grid and you match 3 or more diagonally. It takes some getting used to but once you catch on it's actually a refreshing change of pace. The levels progress quickly and different styles of matching become available such as colors or groups. 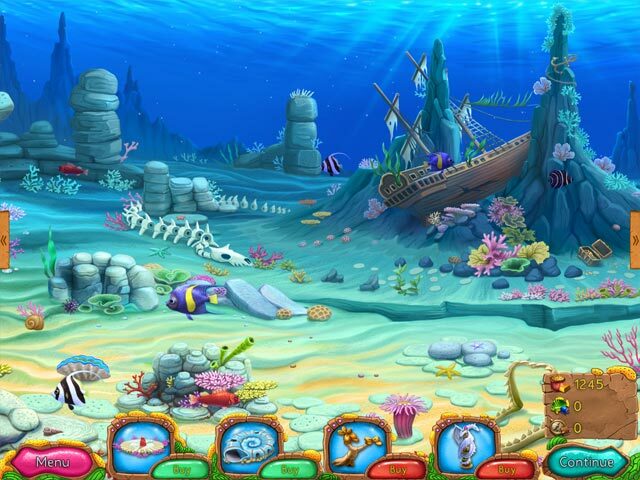 The graphics are very colorful and the music is non evasive, they did a nice job of making the fish as realistic as possible and the game itself is addicting so enjoy! Rated 5 out of 5 by LPERM from Love the group play Didn't remember this one until I saw the group play which I love. Fun and challenging match three game. Rated 5 out of 5 by ecblisa from Great, but not all that new I loved Lost in Reefs 1 and played it several times. Then I played Lost in Night several times. I've bought this game as well and will undoubtedly play it several times also. The games have (to me) very pleasant graphics and music, and get harder at an appropriate pace. You get rewards for playing by being able to build or restore a town. All the things one would expect from a high-end Match-3 are there -- timed or relaxed play, multiple game modes, trophies, etc. My only criticism is that everything is too much the same -- board shapes, game tokens, power-ups, types of obstacles to board completion. This does not keep me from enjoying the game, but some may find it too little like a "new" game.